Is it Nemo or Charlotte. Depends on tgr channel you watch. The name of the blizzard really doesn’t matter. We spent Thursday evening doing some extra prep for the storm, including loading extra hay into the horse barn. 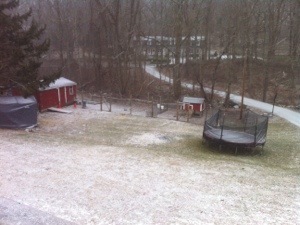 The snow started Friday morning just before 8. 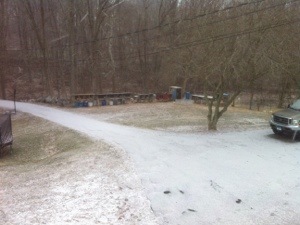 Within 15 minutes, the driveway way coated. Here are the Friday, 2/8/13 8am pictures. 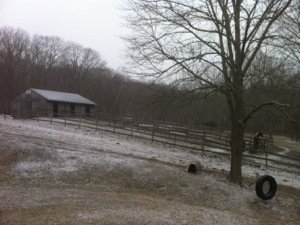 By Friday afternoon, it had been snowing 6 hrs and we had 2-3″. We did the evening chores, first round of driveway plowing, and came inside. A rabbit was roasting in the oven and kids were playing Xbox when the power went out at 6pm. Definitely earlier than expected. We changed dinner plans and moved all the bedding into the living room by the wood stove. Of course, it’s almost 75F in the living room, so I might have to change where I am sleeping. Anna and I went out together to check on all the animals. They are all huddled up in shelters. We have somewhere between 12-16″ of snow already and it is blowing hard. The barn has drifts approaching 3′ against the East (windward) doors. The trees are VERY heavy with snow. We have branches leaning on the power lines to the house. Last I checked, North Stonington had over 1100 customers without power. We can run the generator in the morning to water the animals. I also might be using the Kubota to clear the driveway. The kids will probably appreciate if I pile all the snow in one spot. Now the family is enjoying tea with water heated in a kettle on the wood stove. While I wouldn’t want to do this all the time, it is kind of cozy.